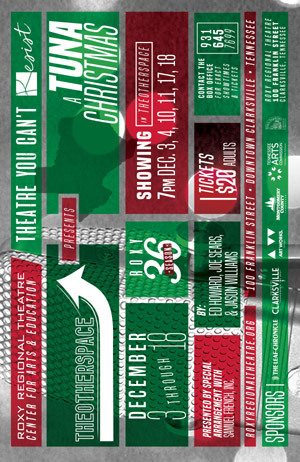 A holiday treat chock full of quick changes, outrageous costumes and funny-bone-tickling delights is coming to the corner of Franklin and First in Historic Downtown Clarksville this season. Ryan Bowie and Brian Best will bring nearly two dozen colorful characters to life in the holiday hit comedy A TUNA CHRISTMAS, playing December 3 through December 18 in theotherspace, the 50-seat black-box theatre located upstairs at the Roxy Regional Theatre. In this hilarious sequel to Greater Tuna, it’s Christmas in the third-smallest town in Texas. Radio station OKK news personalities Thurston Wheelis and Arles Struvie report on various Yuletide activities, including the hot competition in the annual lawn-display contest. In other news, voracious Joe Bob Lipsey’s production of A Christmas Carol is jeopardized by unpaid electric bills. Many colorful Tuna denizens, some audiences will recognize from Greater Tuna and some appearing here for the first time, join in the holiday fun. The second in a series of comedic plays by Ed Howard, Joe Sears, Jaston Williams — preceded by Greater Tuna and followed by Red, White and Tuna and Tuna Does Vegas — A TUNA CHRISTMAS is at once an affectionate comment on small-town, Southern life and attitudes, but also a withering satire of the same. No stranger to the world of one-man, quick-change comedy, Ryan Bowie, executive director of the Roxy Regional Theatre, has previously shown his versatility by playing nearly 40 roles in Becky Mode’s Fully Committed, as well as a diverse range of roles in David Sedaris’ The Santaland Diaries, Jonathan Tolins’ Buyer & Cellar and Fred Barton’s Miss Gulch Returns, among others. Brian Best had audiences rolling in the aisles earlier this season with his Roxy Regional Theatre debut as housewife Edna Turnblad in Hairspray. He has since delighted theatregoers in myriad roles, including Dr. Scott and the Narrator in Richard O’Brien’s The Rocky Horror Show, Phalaccidos in Aristophanes’ Lysistrata and, currently, Kris Kringle in Meredith Willson’s Miracle on 34th Street — and he will no doubt do the same in A TUNA CHRISTMAS. A TUNA CHRISTMAS is presented in theotherspace, the 50-seat black-box theatre located upstairs at the Roxy, and plays at 7:00pm on December 3, 4, 10, 11, 17 and 18. Tickets are $20 and may be purchased online via the below button, by phone at (931) 645-7699, or at the theatre during regular box office hours (9:00am to 2:00pm, Monday through Friday, and one hour prior to curtain). Next post: Happy Holidays from all of us at the Roxy Regional Theatre!